After midday prayers approximately 100 Palestinian, Israeli and international activists gathered for the Friday demonstration against the wall in Bil’in. This week, the protest was held in solidarity with the Palestinian workers to mark International Workers’ Day on Thursday. Protesters set off on a seldom used to route to the wall. Their arrival at the wall was met by soldiers threatening to shoot anyone who approached the wall. After several minutes of chanting soldiers started shooting rubber bullets and tear gas at the protesters. The protesters began to move up to the usual site of the wall protests, the gate that seperates the village from it’s land. The soldiers continued their violence, aiming low with their tear gas canisters which increases the risk that someone will be struck by one possibly resulting in serious injuries. The tear gas canisters set the dry grass in the area on fire in many places. Thankfully the protesters were able to put out the fires before they spread too far. The soldiers continued shooting tear gas even after the protest was over despite the risk of fires. An anti-Wall demonstration of at least two hundred of the residents of the al Ma’sarah village near the southern West Bank city of Bethlehem and dozens of International peace activists on Friday. 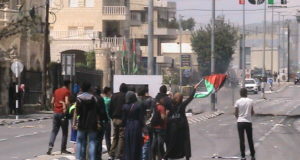 Demonstrators marched from a high school in the village of Al Ma’sarah towards the construction site of the Separation Wall on the village’s farmlands. Work began a year and a half ago no the village’s lands, aimed at confiscating and isolating ten of thousands of dunums of Al Ma’sarah’s land, located south-west of Bethlehem. 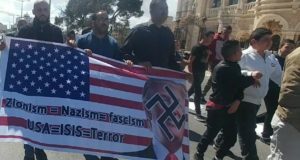 This week’s demonstration was to celebrate May Day (International Workers Day), and was attended by Dr Mustafa al Barghuthi, secretary general of the Palestinian National Initiative, and Khalid al A’za , head of the Popular Committee of Land Defense and Settlement in the Bethlehem district. In addition, there were also a number of representatives of different organizations present. As the protesters were about reach the construction site of the Wall, the Israeli army installed military roadblocks and prevented them from proceeding any further. Mohammad Brejieh, the media spokesperson of the Popular Committee, said that two Palestinians were injured. He added that the Israeli army took many tight procedures to prevent the International peace activists from reaching the village by installing many roadblocks and closed the roads that lead to the village. The soldiers had confiscated a bus with more than sixty international peace activists for more than three hours to prevent them from participating in the protest. 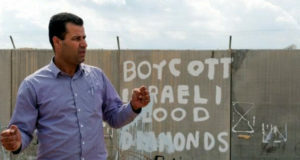 The Popular Committee of Al-Khader village, located near the southern West Bank city of Bethlehem, organized a non-violent demonstration in protest of the construction of the illegal Israeli segregation barrier, as well as the discriminatory and oppressive Israeli policies used daily against Palestinians. On Friday about 300 residents of Al Khader, along with international and Israeli activists, gathered in the village. The village’s residents performed their Friday prayers at Al Nashah Israeli checkpoint located at the entrance of Al Khader. Afterwards Dr. Mustafa Al Barghuthi, a Palestinian MP, gave a speech calling for the continued resistance against the wall and the Israeli settlements. Soldiers were deployed, but the protesters stood their ground for nearly an hour before deciding to end the action. Activists and many international and Israeli organizations allege that as a result of Israel’s construction of the illegal apartheid wall, the free movement of Palestinians, especially workers, has been heavily restricted. The apartheid wall separates workers from their workplaces, leaving them facing serious levels of poverty.